Color my World – 2018 Mixed Media FUN art! 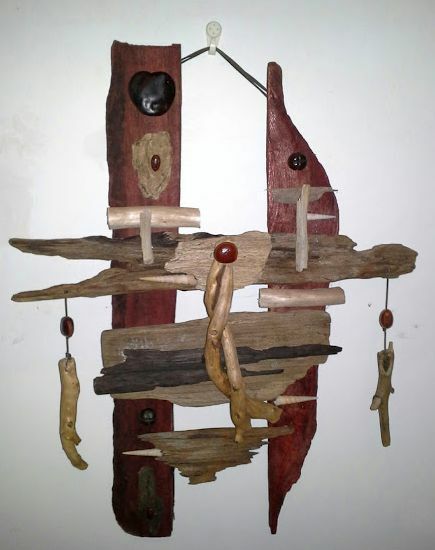 My first driftwood assemblage, with color, balance, and movement — all put together to create a lovely piece. Mary’s Bean on the top right is quite special. For years I wanted to put together driftwood and drift seed wall collages. Finally, in 2015, I decided to jump right in and do it. I have been having a lot of fun going with my flow. This is the first wall sculpture I made. It has been sold to a good friend. It is one of my favorites. Seeds: Sea Heart, Guanacaste Tree Seed, Mary’s Bean, Ox Eye, and shells from the Pacific coast of Costa Rica. Invitation: Keep Falling Into Your Heart. Seek connection. Love one another.